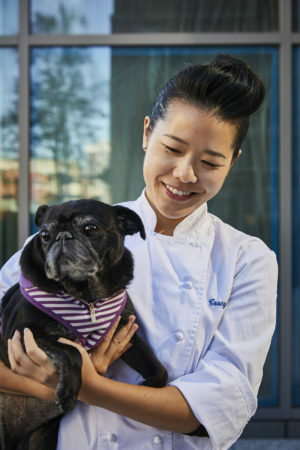 As a food explorer living in Boston, I follow the food blog Tiny Urban Kitchen by Taiwanese American Jen Che. 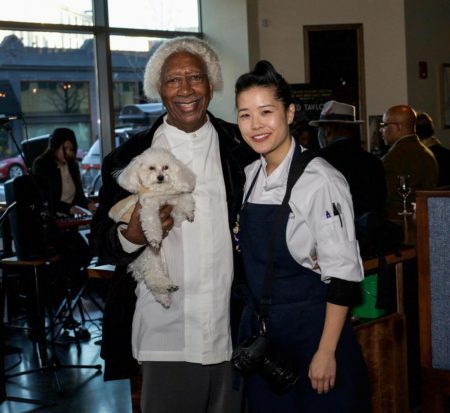 This is where I first heard about the restaurant PAGU and its Taiwanese American chef/owner Tracy Chang, a talented culinary entrepreneur who sports a unique hairstyle (aka the “ramen wave”). 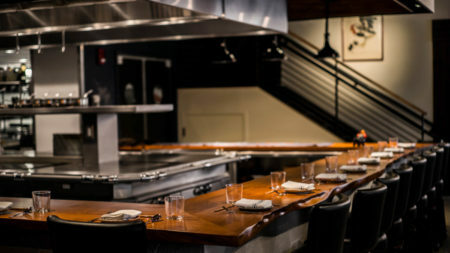 PAGU serves Japanese tapas, a reflection of Tracy’s culinary training at O Ya (one of Boston’s top sushi restaurants) and Restaurante Martin Berasategui (three-star Michelin restaurant in Spain), as well as Le Cordon Bleu in Paris. 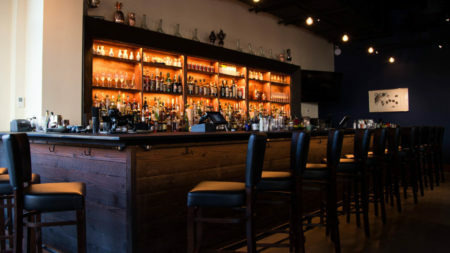 PAGU opened in Cambridge in January 2017 and has caught the attention of the press, being named as one of Boston’s hottest restaurants. The restaurant is often packed for dinner and getting a table on a weekend night without a reservation is rare. People say we’re an Asian tapas restaurant and bar, but we don’t want to be defined by one box or category. We want to push the limits. We aren’t the traditional restaurant experience where you come and eat and leave – the rules aren’t in place in the same way. The space is meant to promote community. We purposely made it so the furniture could be rearranged easily and the kitchen is open so we can have demos. We want PAGU to feel like a dinner party in a living room, where you can engage with others like friends. Food and drink is just a launchpad for gathering people. And my team is my family. I want them to make the most of their time here – to have a meaningful impact with guests in a way that isn’t transactional. It’s not just about “what” we produce, it’s about the “why” – what kind of person do I want to be and what kind of impact do I want to have? We started off as a ramen popup called Guchi’s Midnight Ramen, which was inspired by my friends who actually aren’t in the restaurant industry, like entrepreneurs in tech, professors at MIT, artists, or people working in nonprofit. We were just hungry at midnight one night and wanted to eat ramen. This turned into finding other people who wanted to eat ramen late at night and cooking in a friend’s restaurant kitchen after business hours. Other people eventually wanted in on this too and that’s when we realized there’s a demand for ramen pop-ups, and a hunger for something beyond the traditional restaurant experience. Did you always know you wanted to go into cooking? I always thought I’d be a doctor since I knew that would make my parents proud (my dad is a pediatrician). I was pre-med in college, but became jaded by the system. My personality is to challenge what is existing and I didn’t feel like I’d be able to change the healthcare system in my lifetime. But growing up, my grandma had a restaurant and the idea of owning a restaurant was always in the back of my mind. I actually wrote in my 5th grade autobiography that I’d take over my grandma’s restaurant. Throughout college, I was always eager to try new recipes and cooked as a way to take my mind off exams. Even though I studied Finance and had the idea of becoming a consultant, I put together a cooking portfolio instead. My senior year, I interviewed for a hostess position at O Ya (one of Boston’s top sushi restaurants), but also brought my portfolio of 23 dishes. They obviously knew my real motives, but I told them I was willing to wash dishes and just wanted to be in the restaurant to learn… and they took me! I never looked back or questioned my choice, and had friends along the way who were there to encourage me. Tell me more about your grandma and her restaurant. My grandma was a midwife all her life in Taiwan and moved to the United States to be with her kids. At that time, she was in her 60s and could no longer be a midwife in the U.S. She didn’t want to do nothing, so she opened a restaurant. 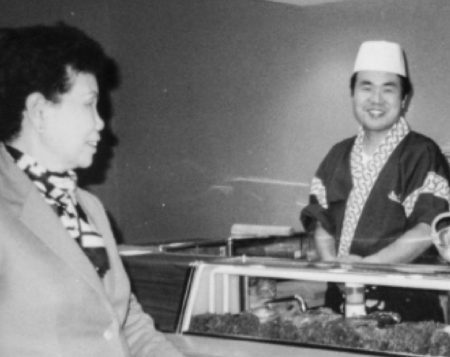 She first opened a Chinese restaurant near Boston College (where I eventually went to school), and then opened a Japanese restaurant in Cambridge called Tokyo. I have fond memories of growing up in that restaurant. It was about more than just the food like green tea ice cream and spicy tuna rolls, it was about the people. I often worked the cashier in the restaurant and my favorite part was talking to people and seeing familiar faces. For instance, Yo-Yo Ma would bring his big white cello case and perform, and Julia Child would visit because she lived around the corner. What was your greatest fear in opening PAGU? My fear wasn’t about not being successful or people not liking the food, but whether I’d be continually challenged. I’ve seen chefs figure out the formula for success where things become muscle memory, and I’ve worked with chefs who have fame, money, and Michelin stars, but I ask myself ‘is that what I want?’ The answer I have now is that I want to be challenged. Okay, time for lightning round! Why pugs? Ever since I was 6, I’ve had pugs, specifically black pugs. I had been thinking of a name for a restaurant for 3 years and one day I started calling my pug Phoebe by Pagu, and it just stuck. What’s your favorite Taiwanese food? Ooh that’s hard. I’d have to say gua bao, which is why it’s on the dinner menu. And also lu rou fan, which is why it’s on the lunch menu! I stayed for the jazz event and understood what Tracy meant by PAGU as a “living room.” Though I didn’t know any of the other attendees coming into the event, people were open to mingling and I ended up staying for several hours chatting with new friends over delicious pinxtos. I even got to meet Phoebe, Tracy’s beloved pug! After spending the afternoon at PAGU, I understood why Tracy is more than just a chef and why PAGU is more than just a restaurant. The space and atmosphere reflected a craft of cooking and managing focused on growth, human connection, and of course, pugs.